Is the GDP really the indicator we should be looking at to compare America with other countries? While GDP might be the best indicator for measuring the health of a country's corporations, profits can be transferred offshore. We need a better measure for the standard of living within countries themselves. One look at the CIA World Factbook clears up this dilemma. The number that's tracked in all countries because, unlike GDP, it indicates the health of a country's people by taking into account factors such as pollution and poverty is the infant mortality rate. 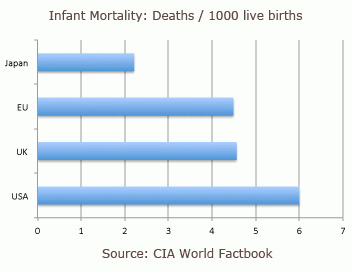 The U.S. has the highest percentage of infant deaths in the first world. The U.S. health disadvantage cuts across class and race boundaries and exists for all socioeconomic groups, including non-Hispanic whites, according to a brand new report, U.S. Health in International Perspective: Shorter Lives, Poorer Health by a panel of experts in medicine, epidemiology, and demography and other fields in the social sciences. Even the U.S. elite under age 55 has higher rates of chronic disease, injuries and death, a most interesting factoid from this report comprising data from multiple studies conducted over decades. Assumptions that minorities and those with low incomes or low educational levels were the only ones at risk are unfounded. The report shows that even well-off Americans who do not smoke and are not overweight have inferior health on average than their counterparts in other wealthy countries. The U.S. Health report highlights the association between social spending and mortality in an analysis of 15 European countries. Each additional $100 per capita in social spending was associated with a 1.19 percent decrease in all-cause mortality, according to one study by Stuckler in 2010 cited in The U.S. Health report. "There is little question that the European welfare model is effective in redistributing income and reducing poverty," The U.S. Health report states. The panel observes that U.S. spending on social services (13.3 percent of GDP) was less than the OECD average (16.9 percent). Social spending is highly correlated with life expectancy, infant mortality, and potential years of life lost.